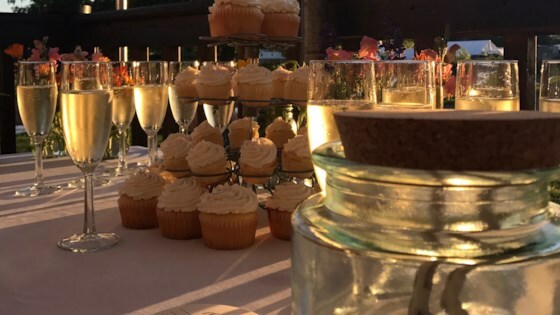 "Champagne + cupcakes= DELICIOUS! Optional: tint the cupcakes and frosting with your desired shade of food coloring." Mix cake mix and 1 1/4 cup Champagne in a large mixing bowl; stir in vegetable oil and eggs. Beat batter with an electric mixer on medium speed for 2 minutes. Pour batter into the prepared muffin cups, filling them 3/4 full. Bake cupcakes in the preheated oven until a toothpick inserted into the middle of a cupcake comes out clean, about 20 minutes. Cool cupcakes in pans for 10 minutes before removing to finish cooling, about 30 more minutes. Mix butter, 1 cup confectioners' sugar, 1/4 cup Champagne, and vanilla extract in a bowl. Stir in remaining confectioners' sugar, 1 cup at a time, until frosting is smooth and creamy. Spread on cooled cupcakes. You don't have to use expensive champagne - the cheap stuff works great! These are perfect for New Year's Eve and weddings! Wasn't any different than a regular white cake to me and the icing was gritty. The icing was a bit too sweet, and the cake was kind of odd tasting.